Montreal boxing fans had been promised six bouts on the latest Groupe Yvon Michel casino card, but the scheduled match for popular super middleweight Shakeel Phinn was cancelled at the last minute, reportedly due to problems with Phinn’s opponent’s medical tests. That said, at the end of the night no one in the standing room only crowd had reason to feel short-changed in the slightest as the main event battle between Francis Lafreniere and Albert Onolunose by itself more than gave ticket-buyers their money’s worth, though almost everyone inside the Casino du Montreal’s Cabaret Room was heart-broken at the final result. But before “The People’s Champ” and “The Punisher” did battle for ten furious rounds, there were four tilts to warm up the crowd, featuring two stand-out performances. Unfortunately, the card opener was a pathetic mismatch. Jorge David Vargas (3-2) was the first opponent light heavyweight prospect Terry Osias (3-0) had faced who owned a winning record, but how that could be is beyond my ability to imagine. Mexico’s Vargas looked like someone plucked off a Montreal food truck or from inside a pastry shop, to judge from his round belly and complete lack of muscle tone. Sometimes one wonders how these soft-touch opponents pass the necessary medical tests prior to a fight. The first serious blow Osias landed, a left hook to the body, put Vargas on the canvas. He rose and surprised us all by surviving the opening round but more heavy punches were landed and more knockdowns followed before the massacre was finally halted in the second. I know it’s customary, if not necessary, for young prospects to be fed a diet of no-hopers early in their careers, but this was ridiculous. Not to mention, dangerous. Clearly, Osias is ready for stiffer opposition. 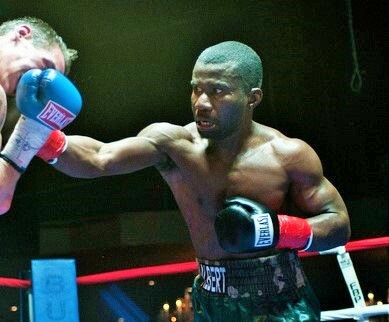 Next up was Louisbert Altidor (7-2), a super middleweight fighting out of Montreal’s highly regarded Underdog Gym. His quick hands and accuracy forced Mexico’s Genaro Ortiz (8-3-1) to initiate a non-stop clinch-fest and fans were treated to more mauling than boxing with the referee issuing warnings and reminding the combatants to obey his commands. 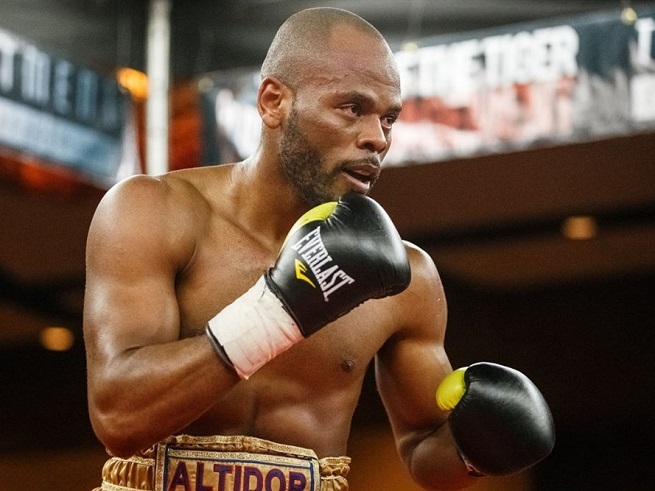 Thankfully Altidor was able to disentangle himself long enough to land some solid shots, score two knockdowns, and bring the match to a halt in round four. That’s two wins in a row for Altidor since competitive points losses to highly regarded prospects Tim Cronin and Patrice Volny. Last month Bruno Bredicean, who had been recovering from a back injury, impressed the casino crowd with a second round knockout. Last night it was his older brother’s turn to put in a stand-out performance in the same ring as super middleweight Dario Bredicean (15-0) prevailed over Mexican southpaw Guillermo Romero (12-4), who is 40-years-old but somehow only has 16 fights. He never threatened the Grant Brothers-trained prospect, but he also never stopped fighting back, giving the undefeated prospect some solid work, along with some solid shots to the groin. It was a rough fight with plenty of butts, elbows, and general messiness, but also entertaining with neither man backing down, though Bredicean, who looked very sharp, clearly won every round. The 24-year-old prospect appears ready for a major “step-up” bout. Yvon Michel signed Christian M’billi (8-0) to his stable just over a year ago and at the time raved about the Cameroon native’s talent and outstanding amateur record. Since then M’billi has done nothing but bear out Michel’s high praise in seven straight stoppage wins and last night continued that trend. Mexico’s Jesus Gurrola (24-13-3) did not come to Montreal to simply present M’billi his eighth pro victory on a silver platter, a fact borne out by his happily joining in when Christian initiated a fast-paced firefight, both men throwing bombs at close quarters, but it didn’t matter. Despite the gap in experience and Gurrola’s willingness to go to war, the Mexican could not cope with M’billi’s aggression, power and hand-speed. An uppercut stunned him midway through the round and a minute later a straight right did the same. But give Gurrola credit: he came out hard for round two and tried to seize the initiative with some cracking body shots, but like some irresistible force of nature, M’billi just walked him down, forced him to the ropes and then put his quarry on the floor with a head-snapping uppercut. Gurrola bravely rose but a vicious left hook to the liver put him down again and ended the fight. 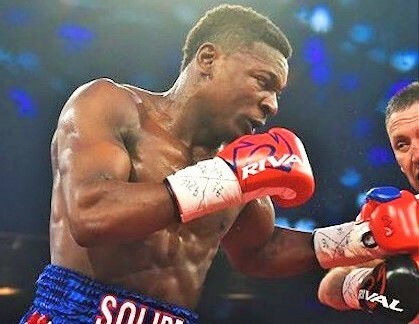 Christian “Solide” M’billi is only 22 and just getting started but it would appear a certainty that this former Olympian will one day hold a world title. Now it was time for the main event and a critical match in the career of Francis Lafreniere, a brave warrior who is no stranger to readers of this website. The fighter affectionately nicknamed “The People’s Champ” earned that moniker for two reasons. One, he is a crowd-pleasing brawler, and proud of it, modeling his fighting style after his idol and a true legend of Montreal boxing, Arturo Gatti. And second, more than once in his career, Lafreniere has been on the wrong side of highly debatable points verdicts. In 2013, Francis found himself with a less-than-impressive ledger of 3-5-2, but fans knew the official record did not do justice to Lafreniere’s work ethic and gutsy performances, to his determination and courage. Thus, if he wasn’t a champion on paper, he was exactly that in the hearts of Quebecois fight fans, his people. The ride since then has been nothing short of inspirational. Thirteen straight wins, most of them fought in front of appreciative, full-capacity home-town crowds, the run bringing Francis three major titles and a top ten world ranking with the WBO. 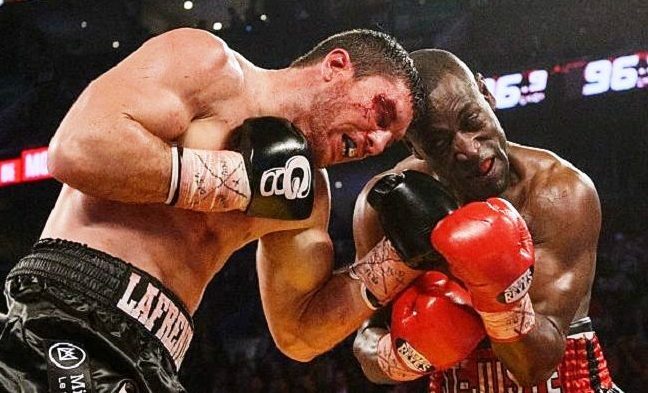 The high point in all of this was a thrilling ten round war against Renan St Juste at the Bell Centre on the undercard of Kovalev vs Pascal II, a victory which earned Lafreniere the IBF International title. Despite St Juste’s advantages in experience and power, Francis rose to the occasion and delivered a tremendous performance, the action-packed slugfest inspiring a standing ovation from the big crowd. Afterwards, some of HBO’s people quietly expressed regret they had not featured one of 2016’s most exciting fights on that night’s broadcast. Lafreniere battles St Juste in the Bell Centre. 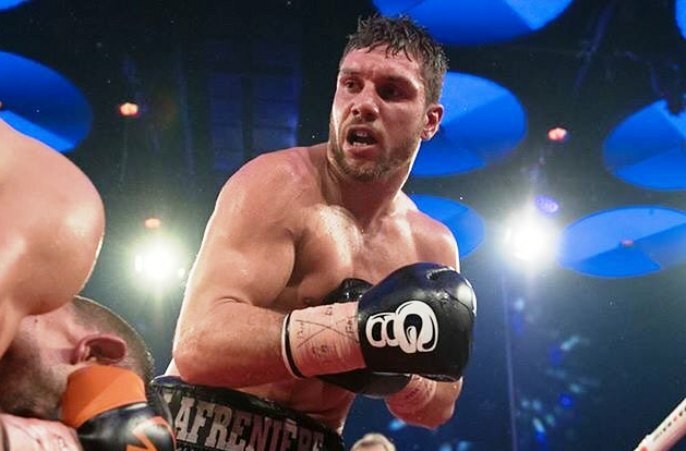 Following that huge win the challenge for Lafreniere’s backers, Rixa Promotions and Grant Brothers Boxing, was to secure the right matches that would elevate his standing while risking no more than necessary the momentum he had attained. 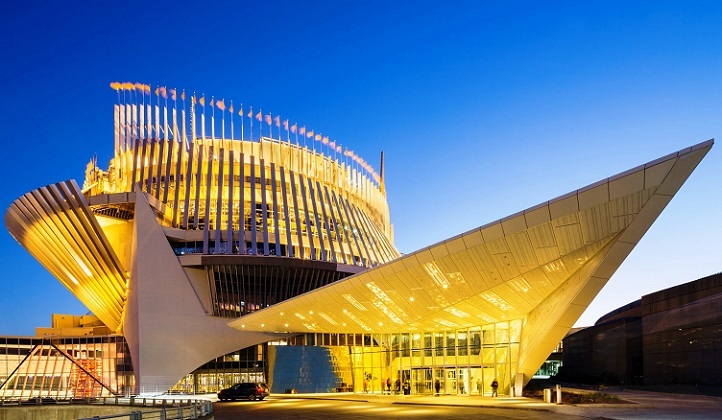 A strategic partnership between that team and Yvon Michel led to appearances at the Montreal Casino and on the undercard of the Eleider Alvarez vs Lucian Bute bout in Quebec City. And last night’s match constituted a continuation of this alliance as well as a crucial step towards ever more lucrative opportunities, as Onolunose represented perhaps Lafreniere’s most formidable opponent since the St Juste fight. With 22 wins against a single defeat, the 37-year-old Nigerian native had everything to gain and little to lose heading into what figured to be his last chance at a major title and a world ranking. And indeed, Onolunose fought as if his entire career was on the line. From the opening bell it was clear the challenger was not the least bit intimidated by the hometown crowd and was determined to give his all for the chance to broker his opponent’s gains into a massive step forward for his own career. He refused to back down from Lafreniere’s customary relentlessness and secured the faster start, out-landing Francis in the opening rounds. Soon enough it was evident that “The People’s Champ” had his work cut out for him. What followed was a grueling war, every round highly competitive and brim full with action. The prevailing pattern saw Lafreniere coming forward but taking punishment as he did, Onolunose landing the clean shots at mid-range. But once on the inside, Francis often found himself with little punching room, or in a bear hug with Onolunose. A good deal of clutching and grabbing was going on at close quarters and often “The Punisher” forced a clinch before Lafreniere had a chance to let his hands go. 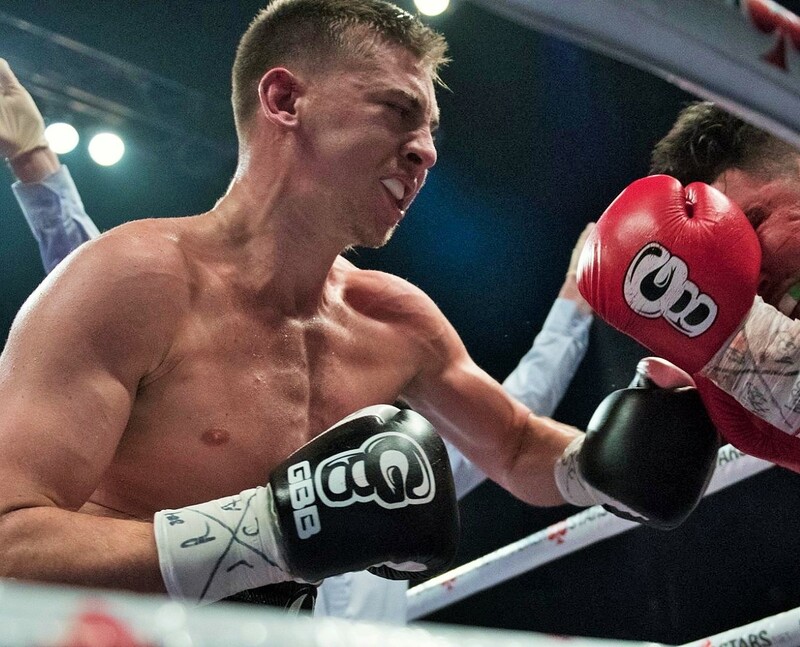 That said, there was still no shortage of inside exchanges, a fact evidenced by a brutal round seven which saw three minutes of almost non-stop, close-range brawling. By this time, most everyone knew that Onolunose had the edge. It was close but there was no way to overlook the fact that he was consistently landing the cleaner shots. The crowd tried to lift their man with chants of Fran-cis! Fran-cis! but Lafreniere just could not seize control. In round eight he got his jab going for the first time, but despite its effectiveness, he failed to keep throwing it. 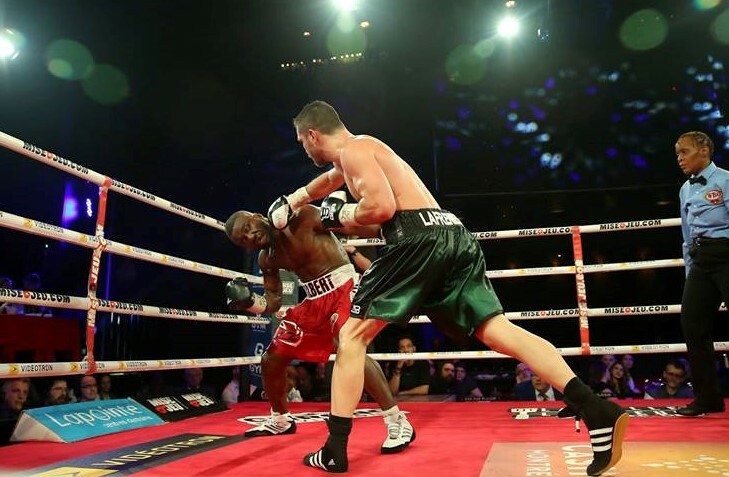 The final round saw him ratchet up his activity rate and outwork Onolunose, raising hopes he might pull out a close win or salvage a draw, but the ringside arbiters didn’t see it that way. One judge scored the bout even, but the other two gave it to Onolunose with room to spare. 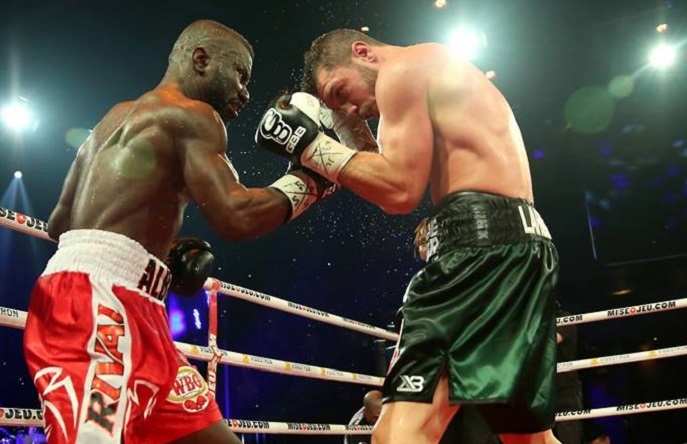 Afterwards much talk was heard about Onolunose holding too much and the referee not penalizing him for it, but while these complaints were not devoid of credibility, the fact many seemed reluctant to confront was that Lafreniere’s performance lacked both urgency and focus. Non-stop pressure and volume punching by themselves, even for a fighter as tough and brave as Francis, can only take you so far. Needed last night was more creativity and movement, as well as angles and level changes, not to mention more hand and foot speed. Much of Onolunose’s success stemmed from the simple fact that the older man repeatedly beat the younger fighter to the punch. The People’s Champ has given Montreal boxing fans so many great fights. Another consideration which few may want to contemplate is the fact that Francis Lafreniere is only human. While 24 fights cannot be said to be a prolific career, the fact remains that the vast majority of those outings represent punishing battles. “The People’s Champ” prides himself on putting on exciting shows for his fans, going to war every time out, but such a fighting style can result in a short prime. Add in the fact that outside the ring Lafreniere is both a devoted father and a hard-working businessman (he owns and operates a successful gym in his hometown of St-Clet), plus that he is renowned for his intense workouts, and you may have a 29-year-old pugilist whose sharpest days are behind him. Clearly, something in terms of fire and vigor was missing last night. Or maybe such an observation is unfair to both Francis and Albert Onolunose, two gladiators who fought their hearts out. Few boxers can compete with Lafreniere when it comes to grit and determination but “The Punisher” proved a most worthy adversary. It takes two brave warriors to give boxing fans an exciting and memorable battle, and that’s exactly what we got in last night’s main event. Any takers for a rematch?